According to this Komeda site this concert took place on December 7, 1996. 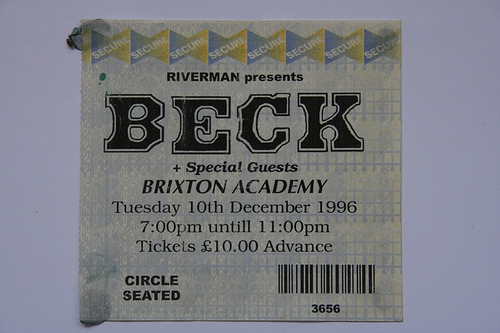 They also list a concert in France on the same day, though, so I will assume that Beck.com is right that the UK concert took place on the 10th. The bootleg/show begins with an intro by Steve Lamacq (a DJ in London), who mentions Beck's classic first album "Mellow Doubt." "The New Pollution" has a crazy funk jam at the end, but fits perfectly into the song--awesome! Must be one of the best live "Derelict"s out there. Beck introduces "Where It's At" as a song called "Make Out City," which confuses the audience--they don't react until he mentions it being about two turntables. Beck taps into his future Midnite Vultures persona for a skanky as all hell early rendition of "Debra." Relatively uninteresting acoustic set, but the whole show is superb.